Nice easy scramble with great views of the North Rainier peaks. 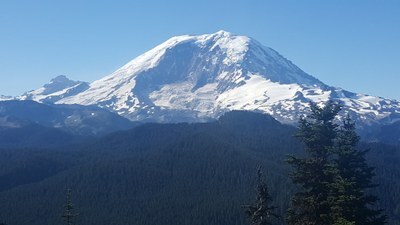 Views are very dramatic, especially if you have done some of the other peaks in the northside of Rainier. Road is quite bumpy, but drivable by any car with sturdy tires. Trailhead is quite popular, but most people are going to Summit Lake. Of the 10 cars, we saw nobody else on the Bearhead routes. Trip is mostly trail. Scramble up to East Bearhead is mostly grassy slopes with some minor rock scrambling. I would call it a T2.5 S3. On the drive out, we stopped at Coplay lake, (1 minute side trip) and went swimming in the lake. Nice refresher. There is good access, (recommend you take some flip-flop shoes). FYI: There is a vault toilet at Coplay, but not at the Bearhead trailhead.